Did you know that in the United States there are more than 1 billion colds and upper respiratory infections every single year? In addition, up to 25% of the population will suffer the flu, resulting in 200,000 hospitalizations. As most of us know, winter time can bring an overabundance of germs to your front door, despite your best efforts. In fact, adults generally get 2-4 colds a year, with the majority of those occurring in the winter months. If you are older, have a chronic condition (such as heart disease, asthma, lung disease or blood disorders), or have a compromised immune system, getting a flu shot can be a good way of avoiding the flu. There are three flu pandemics recorded in the 20th century—the 1918 Spanish flu, the 1957 Asian flu, and the 1968 Hong Kong flu. In the 21st century, there has been only one flu pandemic thus far—the 2009 H1N1 flu, also known as the swine flu. Although a case of the flu is generally mild and self-limiting, it can result in hospitalization in some instances. Vitamin C—although vitamin C will not prevent colds, as claimed by some, it can reduce the duration of a cold, as well as the severity of the symptoms. Some research indicates that higher doses of vitamin C (2,000-8,000 mg) taken once a cold sets in, may be able to significantly reduce the duration of the cold by up to 20%. Zinc has shown even more promise than vitamin C in reducing a cold’s duration, when the zinc is taken within 24 hours of the onset of the first cold symptom. Zinc also strengthens the overall immune system, although it is important to note that some who take higher doses of zinc have noted nausea and changes in taste and smell perceptions. Elderberry has recently come to the forefront as a natural treatment for flu symptoms. Scientifically speaking, a handful of human trials have concluded that elderberry does decrease flu symptoms, however more research is needed. As a side note, if you grow your own elderberry, take care to look up preparation guidelines, as parts of elderberry can be toxic when not properly prepared. An herb known as Pelargonium sidoides has shown significant promise in reducing cold and flu symptoms, as it can help stop bacteria from attaching to the lungs and throat. Pelargonium sidoides has not been shown to be effective as a preventative measure. Once you have a cold, however, it can reduce the severity and duration of the symptoms. 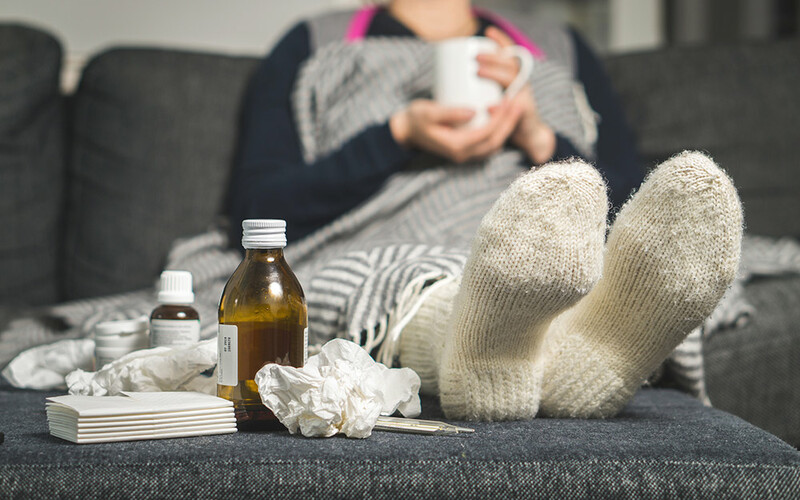 Echinacea has recently gained considerable popularity for its ability to reduce the duration of colds and flu, and one clinical trial found the use of Echinacea also showed some promise in preventing colds and flu. American Ginseng – studies have shown that American Ginseng can reduce the number of colds by 25% and can reduce the duration by as much as 6 days. Be careful, however, because the side effects can include insomnia or headaches. It is best to take this supplement earlier in the day to avoid having difficulty sleeping. If you want to stay well this winter, you might want to consult your doctor and look into one or more of the above supplements. But What About Natural Foods? Fruits and vegetables – it’s no secret that fruits and vegetables are an important part of a healthy diet, but did you know that they can also boost your levels of cold and flu-fighting nutrients? Garlic – this fragrant food actually boosts immune properties and can help you avoid colds in the winter time. Chicken Soup – studies have shown that chicken soup can actually be a remedy for the common cold – in addition to tasting delicious. Fish Oil – Omega 3, in particular, can increase white blood cell activity, which can help you when you are sick. Can You Prevent the 5 Common Medication Problems in Aging?